The Worlds first range of app driven smart pianos. Covert your iTunes library to easy to play piano music. Stream lights make learning simple. Statistics show that 81% of the UK’s population now have access to a smart device. We also know that a massive amount of these people would like to play a musical instrument, but never get round to doing it. The biggest reasons many people never achieve their dream is because they think it is too difficult to learn, and that they don't have enough time to take lessons. Well, for those people that have yearned to play the Piano, the answer may just have arrived. The brand new 2017 Yamaha CSP series Clavinova Digital Pianos are the world’s first app driven smart Pianos. Yes they have all the hallmarks of a normal Yamaha Clavinova digital Piano, an instrument with a choice of unsurpassed authentic Grand Piano voices, digitally recorded from two of the world’s most revered Grand Pianos, the “Yamaha CFX” and the “Bosendorfer Imperial Grand”. 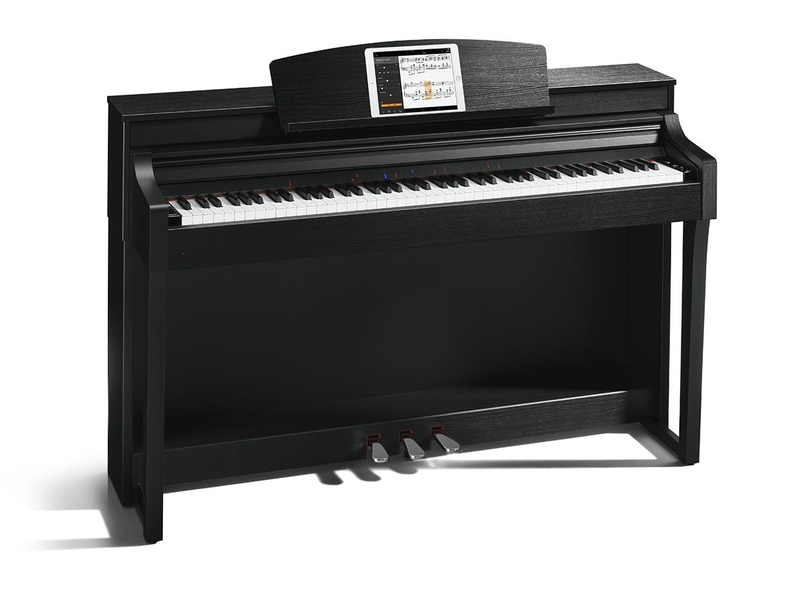 Yes, they have a keyboard action that feels as good to play as any top quality acoustic instrument, Yes, they come in a stylish cabinet in a choice of finishes that will compliment any setting. But, that is where the similarity ends, as the “CSP” series are so much more. Place your Ipad onto the instruments music rest and after a simple Bluetooth pair up, you are ready to unleash the “CSP Smart Piano App”. Put simply, a fully integrated tuition suite that has hundreds of inbuilt songs/pieces from the great classics to today’s top tunes, all providing original off the record arrangements for you to play along to. What’s more, once you have finished all those inbuilt pieces, you can introduce your “Itunes” library for unlimited musical potential. Of course, you may ask what use all this if you don't play the Piano?, the answer lies deep in the heart of the “CSP” and the “Smart Piano App”. Yamaha have for many years been developing technology that instantly scans your audio library and instantly produces a Piano arrangement of the chosen piece. For the first time ever, that technology is now available, on the “CSP” Smart Piano. And once you have your piece, you can choose the type of arrangement, complete beginner or maestro performer, pair this with the “Stream Guide Lights” above every key, and you will be playing your favourite tunes in minutes, not months. Put simply, if you or your family want to play the Piano, or are looking for an inspirational upgrade from your present instrument, the “CSP” is a truly innovative Piano that cannot fail to inspire you. If you are looking for a fantastic deal on a Yamaha CSP150B, CSP150WH, CSP150PE, CSP170B, CSP170WH or CSP170PE, look no further.